Stephen Johnson is one of 60 students in the UK taking part in the challenge. BA (Hons) Architecture student Stephen Johnson has been accepted to take part in the 2019 TRADA University Challenge. The annual challenge, which takes place at the University of Sheffield on 8-9 February, brings together multi-disciplined students from universities across the country and challenges them to design a building predominantly made from timber. The task for 2019 is student accommodation, with a focus on health and well-being, energy efficiency and building to budget. Students are tasked with designing this building around real life constraints provided by the existing site that has been chosen for this challenge; an old shopping centre in the heart of Sheffield’s shopping district. As an additional challenge, and to emulate real life experience, students of quantity surveying have been added to each team this year – stressing the importance of building to budget. Tabitha Binding, TRADA’S University Engagement Manager shared “Our University Challenge is all about putting multidisciplinary teams, where students have not met prior, up against a strict deadline – and watching them flourish while working together within a practical context. We want to help students gain confidence in how to design, specify, cost and build with timber and timber products”. Universities involved include Bath, Bournemouth, Bristol, Canterbury, Cardiff, Coventry, Derby, Dundee, Edinburgh Napier, Herts, Leicester DMU, Liverpool, Newcastle, Norwich University of the Arts, Nottingham Trent, Reading, Salford, Sheffield, Sheffield Hallam, Strathclyde, Trinity St David, UEL, USW, and UWE. 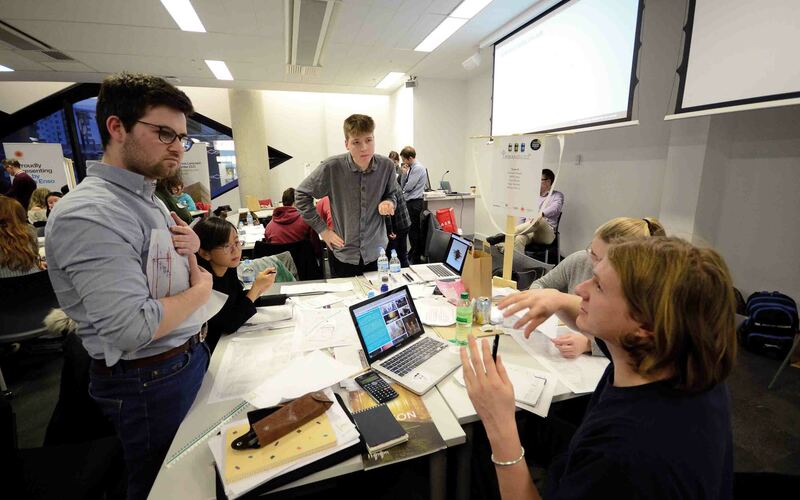 "The TRADA University Challenge is a fantastic opportunity for students from a variety of built environment disciplines to work together on a really quick design challenge. We’ve been really impressed with Stephen’s progress on our BA Architecture course, and we had no hesitation in nominating him to take part."